Just one hour from Miami lies the intimate island of Cayman Brac, one of two sister islands located northeast of Grand Cayman in the calm waters of the Caribbean. From its remote sandy beaches to its rugged, scenic cliffs, Le Soleil d’Or takes advantage of the natural bounty of the island along with the warmth of its people to create a beachside farm-to-table retreat of unsurpassed seclusion and serenity. Although once a haven for pirates who used the island to replenish their supplies, Cayman Brac has since become a sheltered location to experience the magnificent vistas and seascapes of the Cayman Islands – but in a more pristine state than the heavily-trafficked Grand Cayman. The islands’ sparkling blue waters elevate any activity, whether on shore, on the water or under the sea. Beyond the expected beauty of the Caribbean, however, is the Bluff. Made of lustrous white limestone, the Bluff is the architectural backbone of the island, running the full length of Cayman Brac. The bluff is so magnificent that the island was named after it, as “Brac” is the Gaelic term for bluff. This captivating feature creates endless opportunities for natural exploration, offering a range of hiking trails, caves and natural pools, as well as rich flora and wild fauna. It also provides some of the most unexpected and panoramic views in the Caribbean. Despite being far enough removed to make you feel like you’ll never be found again, nearly every convenience is still immediately available. In addition to the 5-star amenities of Le Soleil d’Or, the island features grocery stores, restaurants, bars, spas, fishing charters and medical centers. 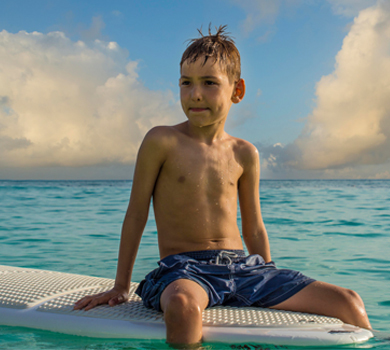 With opportunities for recreation both above and below the sea, your only challenge will be deciding what to do with your days – either focusing on activities to energize the body or letting the stillness of Cayman Brac invigorate your mind as you bask in the golden sunlight. 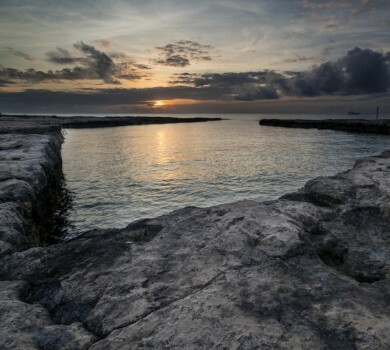 Cayman Brac attracts diving enthusiasts from all over the world for its untouched seascapes. With more than 50 dive sites that include reef, wall and wreck diving, and 100-foot crystal clear visibility, the island is considered one of the world’s premier scuba diving destinations. With nearly 12 miles of pristine white sand beaches, Cayman Brac is an oasis that stands apart. Guests can enjoy the sparkling waters and sunbathe or swim in privacy at Beach Soleil, an expansive swimmable stretch of the island reserved solely for guests of Le Soleil d’Or. Cayman Brac is host to several unique natural swimming pools, which provide the ideal setting for a day spent snorkeling or swimming – or the relaxing end to a long hike up the towering Bluff. 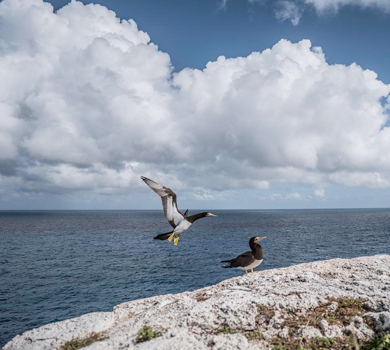 35 marked nature trails lead to various adventures around the island, including views of exotic birds, historic landmarks and wetland habitats. 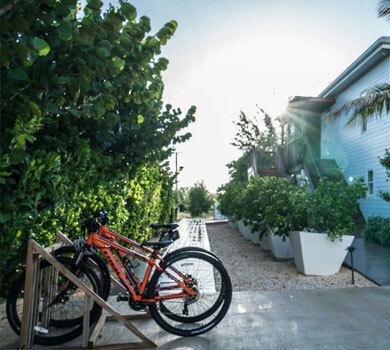 For those that prefer traveling on a set of wheels, Le Soleil d’Or also has bicycles available to explore the island. Cayman Brac’s diverse flora and fauna are mirrored underwater, attracting various species of fish and providing ample choices for many exciting types of on and off shore fishing. Whether looking to hook a Wahoo or a Barracuda, the geography of the ocean floor – which plummets thousands of feet a quarter mile from the beach – allows anglers to fish for large migratory species year-round. There are almost 200 part-time and full-time resident species of birds on Cayman Brac, which are viewable throughout the year. Guests wanting the best bird-watching opportunities are encouraged to come between October and April, and may be interested in checking out island’s Parrot Reserve. 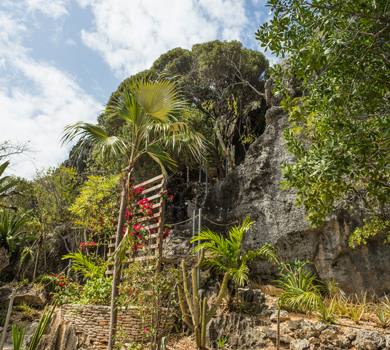 Limestone caves can be found throughout the island and offer spelunkers a rare glimpse of the delicate underground foundation of Cayman Brac, and even more unique views of the Cayman Islands ecosystem.